We just move to a new place. This mini appartment is a all in one type, and everything we need in a house is available there. Name it! Bed, book shelves, wardrobe, mini fridge, bathroom, cooktop, washing basin. The problem is its mini size cooking space. A full size wok cannot fit in it. Flat pan is not suitable for cooking fried rice due to it'd low side. 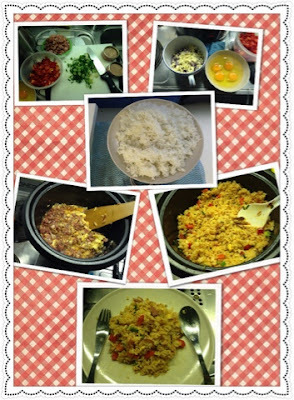 So, should I give up cooking fried rice (read: My husband's favourite menu)? No. We still can cook fried rice perfectly with Rice cooker bowl, with the same procedure as my previous fried rice recipe, I managed to cook a decious fried rice. Since it tastes too good, we'll suspectedly finish it in 2 meal.